The planned, annual pruning on DeSilva Island Eucalyptus trees for view and safety is scheduled for September 19th-23rd. This work is part of a successful program that protects nesting Great Blue Herons and public safety, while maintaining view corridors. One hazardous tree will be removed to protect life and property; the other 99 protected trees will be pruned, as needed. A replacement tree will be planted in December. 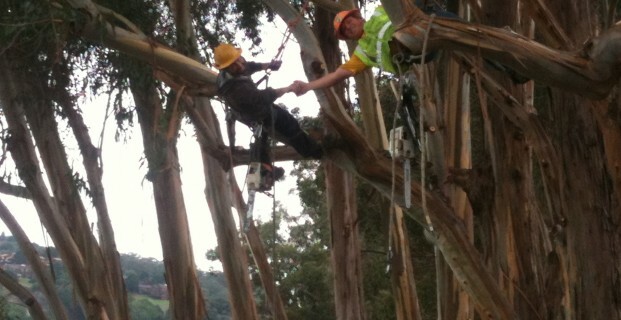 The Eucalyptus at DeSilva Island will be pruned by Sonoma-Marin Arborists, Inc. Annual pruning of these mature Eucalyptus trees helps maintain treasured views of Richardson Bay for DeSilva Island residents and safety for pedestrians using the public shoreline path below. This work will be done outside of the bird-nesting season in accordance with the approved DeSilva Island Tree Management Plan that has been successful in maintaining the bird heronry since the homes were built in 2001. Please contact Dr. Kent Julin for questions: 415-419-6960.